The Mid-Atlantic Road Racing Series (MARRS) held its second and third regional SCCA Club Racing event of the 2011 season on Saturday May 7th and Sunday May 8th at VIR in Southern Virginia. Ted flew into Charlotte airport from Seattle. Larry flew into DC from Chicago and drove the 45' motor home down to VIR. The motor home pulled the 34' enclosed trailer with three of the race cars in it. What an adventure! Larry has become the new designated driver for the "away" races. Since none of us live in the DC area full-time, they all seem like "away" races - except the cars call the Summit Point track "home" since they do not require a trailer ride. 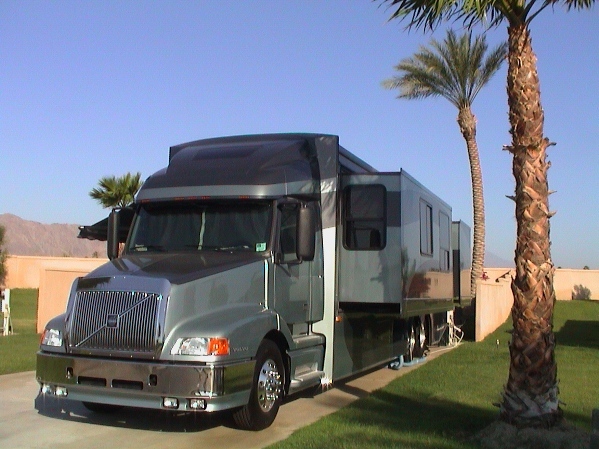 When the trailer's 5 foot tongue and the tractor's 8 foot cab are added to the coach and trailer, the overall rig exceeds 90 feet in length! Ninety-plus feet of truck and trailer heading down the road is something (see photo below). Good thing the Volvo tractor has 565HP and 2,000 ft/lbs of torque! It didn't even break a sweat. Everyone was happy that the two trailer hitch components held! Larry and Ted practiced on Friday and Ted re-acclimated himself to the track. Brother Bob felt well enough to fly in very late Friday night (actually early Saturday morning) to join his two brothers. Saturday's qualifying race went OK with Ted netting a 20th place grid of the 50 SpecMiata (SM) cars. In the race, Ted moved up to a semi-respectable 16th place finish. 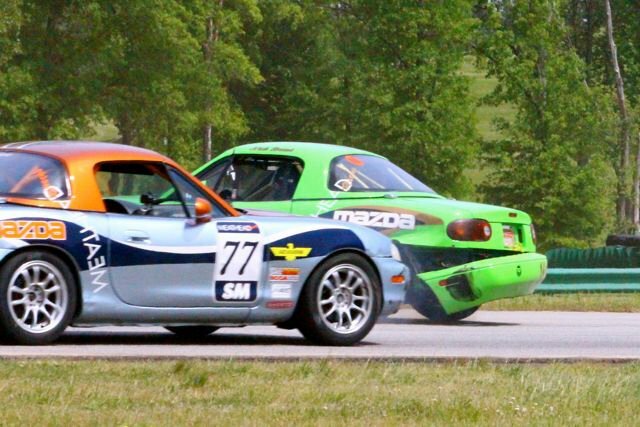 Unfortunately the race included double contact when teammate Nick Bruni sent Ted into a tank-slapper resulting in Ted colliding with the rear of Nick's car as he re-entered the course (click to see video). This crash bent Ted's tie-rod and bent Nick's left rear control arm enough that Nick could not finish the race. Sunday's qualifier was in the rain, but Ted managed to move up to 17th place with a 2:25.2. In the race, Ted set a personal best lap time of 2:23.646 (video) and finished well enough to move up to 13th place after running in 12th place for part of the race. These finishing positions were vastly better than Ted's showing last year for the VIR MARRS 2/3 races. Bob Cahall also raced in the SARRC SSM race and finished 1st of two racers on Saturday and 2nd of two racers on Sunday after leading the race until half way through the last lap until a spin in Oak Tree. Even though there were only two racers in that class, Bob received a trophy for both races. Larry did beat Bob in all of the races they both participated in for the weekend. Larry set a personal best of 2:31.0 and Bob had a 2:31.9. See Facebook photos of MARRS 2 and 3 courtesy of Karen Dildei.